The other day I was listening to the latest episode of “Connected” on Relay.fm, when Stephen and Federico debated the position of the dock on an iPad. Among listeners of the show it is common knowledge that Stephen is heavily into placing the dock to the right edge of the screen on macOS. Federico, on the other hand, presented a screenshot of his MacBook Pro that he only uses for recording, and that screenshot showed the dock on the bottom of the screen. Federico said that he was more comfortable with this layout since it is also the only setting for the iPad that he uses as this main computer. After flipping the layout from portrait to landscape the dock simply stuck. Of course, this reminded me of said discussion I listened to a couple of days before. This looks really strange because the orientation of the icons is still in portrait. The springboard was fully responsive during this short period in time. I actually had a hard time readjusting the position of the dock to normal. 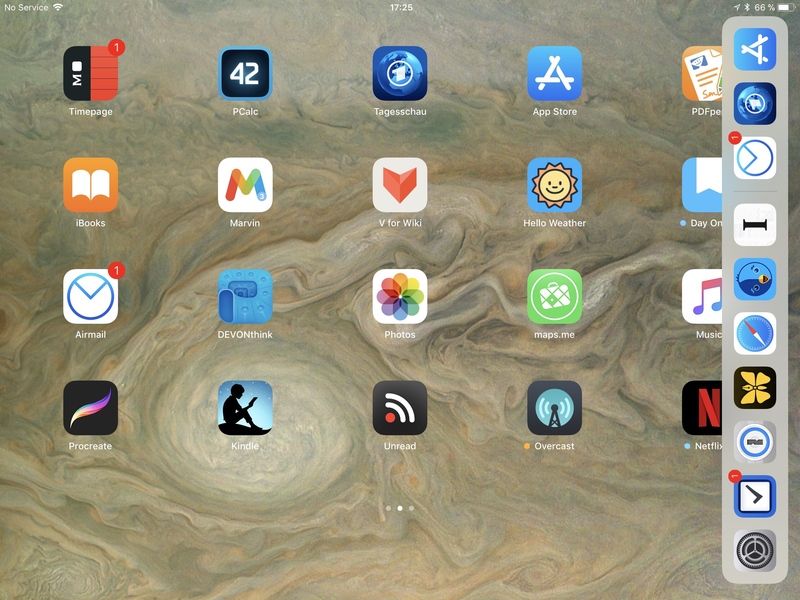 I went through a series of orientation changes and switching the device on and off until I finally managed to get the stuck dock to the bottom of the screen in landscape orientation.